Chester P. Siess, LSU graduate and former Professor Emeritus of Civil Engineering established a bequest to support and benefit programs and activities of the Department of Civil Engineering. The Chester P. Siess Distinguished Professorship was established through the generosity of Chester and Helen Siess and his former students, Joseph and Mary Colaco. Chester P. Siess, born in Alexandria, LA, earned his B.S. in Civil Engineering from Louisiana State University in 1936 and his M.S. and Ph.D. degrees in Structural Engineering from the University of Illinois in 1939 and 1948 respectively. Dr. Siess was a charter member of the 1860 Society, the LSU Engineering Hall of Distinction, a charter member of the LSU chapter of Tau Beta PI, Engineering Honorary, and a charter member of the LSU chapter of Chi Epsilon, the Civil Engineering Honorary Society. 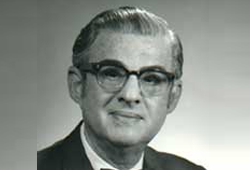 Professor Siess' contribution to the profession came through relentless efforts in his research studies, his instruction of more than 1,100 students, his intensive activity to develop modern codes and standards, and his published work directed to practical applications for improving and understanding of the behavior of reinforced and prestressed concrete elements in bridges and buildings. During his extensive research, his informative writings, his effective teaching and stimulation of students and co-workers, Dr. Siess made a significant contribution to structural engineering with worldwide influence. Dr. Siess' generosity will provide for extraordinary opportunities and results for the LSU Department of Civil Engineering.